Marveling at the breathtaking mountain valleys is a delightful experience for a lot of people. While taking in the scenic beauty of the Cascade Mountains is a source of joy for many, racing against the piles of snow is a remarkable experience. Skiing as a sport and a recreational activity has been intrigued by adventure lovers for a long time. Once you reach Wisconsin, exploring the vistas of the Cascade Mountains will give you an opportunity to peek into nature. The mountains offer a sprawling place of over 45 trails and 4 different terrains which are suited for people across different levels. Someone who is a beginner, an intermediate or an expert will find their calling in the snow-capped mountains. As the place is well- connected with 10 lifts, getting to the apex of the mountain peak is a delight to behold. Looking for Ski rentals near the Cascade mountains, Wisconsin is easy as you have access to different networks. Long, gigantic slopes of Cascade Mountains beckon the passion of all skiing enthusiasts. When you are ready for your adventure, procuring the right equipment is imperative. The Ski and the snowboard bindings that are available on rentals should be adjusted in a way which fits around your body. This will help you navigate across the mountain slopes in a seamless manner while enjoying the splendid landscapes around you. Even when you are a beginner and undertaking Skiing as a recreational activity, you should have the knowledge about the techniques that you should practice. The art of having control over your movement and navigating through different terrains needs professional guidance. As the snow conditions change, having a firm mental and physical presence is required. Dressing up for your Skiing expedition, you need to dress in the right manner. ‘Layering’, i.e. wearing different layers of clothes beneath your costume helps you regulate your body temperature. Since the temperature keeps on changing, clothes which are water- resistant absorb the sweat and keep you warm. When you have to Ski uphill or slope down, an accurate vision and perspective of the place help you Ski easily. You should look at the snowboarders around you and know when to control your movements. To ease out the navigation to the Cascade Mountains, living in a comfortable hotel which is in the vicinity of mountains makes a great choice. Reaching the Cascade Mountains becomes exciting and feasible when you stay in a hotel which is located close to the Skiing site. 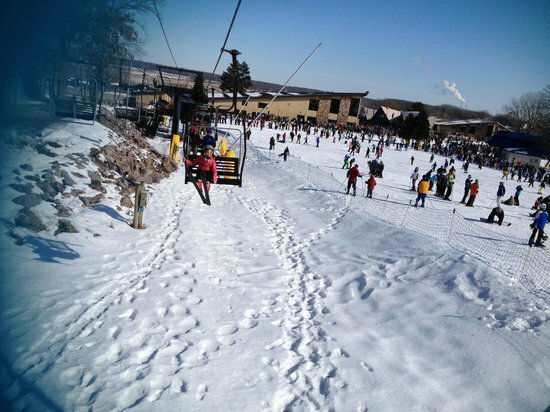 In Wisconsin, ski resorts with lodging amenities give you unmatched comfort. Whether it is about feasting on delectable breakfast in the morning or relaxing in a comfortable bed once you are back from your Skiing trip, you get them all. The accommodations are accompanied by different amenities like the air conditioning services, an indoor heated pool, WiFi connections, and flat-screen TVs. When you are back from your Skiing adventure, you can lay back and relax while catching up with your favorite TV shows and movies. At the Ramada by Wyndham Wisconsin Dells, you will have access to all the amenities and essentials like microwave, refrigerator and a coffee maker. It’s time you experienced hospitality at its best along with luxury manifested in comfort making you feel at home. To know more about the tourist attractions in Wisconsin and amenities that we offer, browse through our web pages.